A couple of weeks ago, folks from our fair city went to Alaska on a cruise. We were in amongst them. We quite enjoyed being there. The weather was wonderful. The company was convivial. The conversations will be confidential. The names are changed to protect the innocent. So far, all the cruise stories have happy endings and great photographs. Many of the participants were retired educators. You have forgotten that when a teacher-type person asks you if you want to do something, it sounds more like a command than a question. Such was the case for most of the week. “You are meeting us for dinner in this spot at this time, right?” Would you turn down that invitation? I was afraid I would be sent to detention for refusing a dinner request. Funny thing is every time something funny happened, someone would ask me, “Are you going to write about that?” The question was sincere. In some cases, it was asked in the hopes that I would write about the exploits of some of our intrepid adventurers. I note that the girls caught bigger fish than the guys! Other times, the question was posed with the trepidation that I might write a story. Yes, I know you thought I didn’t see that… but I did! This moment text messages are being sent to the other adventurers that I am writing about them. Cruisers have reached for another cup of coffee, reputations are hanging with each word. What should I say? Who can I use as a prime example of some deep spiritual truth? What story will you enjoy? I could auction off my cruise diary. Really there is nothing but joyous stories to share. You will get them from time to time just to keep the travelers on their toes! We were honored to be included on the trip. We had a great time and none of the Ten Commandments were broken. I was overwhelmed by the beauty of Alaska. God was doing good work when he made that land. 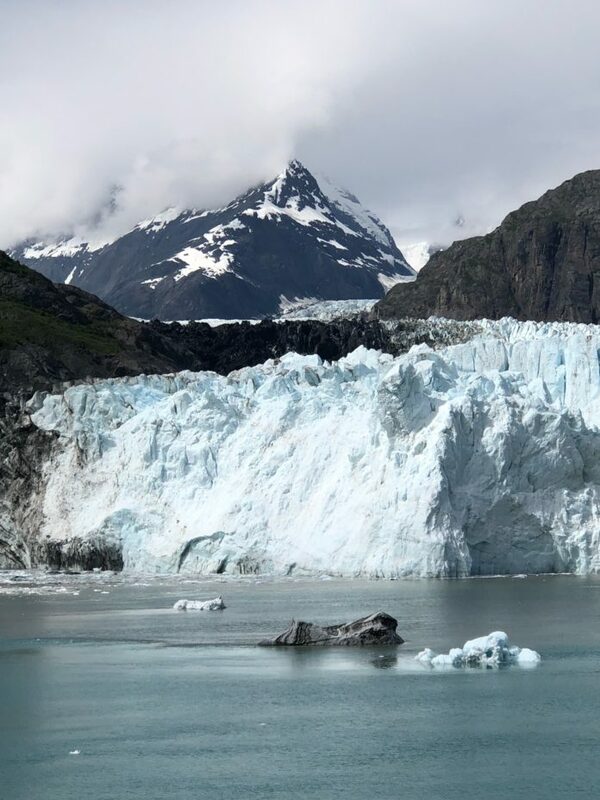 Part of the cruise took us to Glacier Bay. We did not disembark. We stayed on the ship and observed the glaciers from a distance. I was watching the glacier from my balcony. I put down the book on “The History of Some Obscure Theological Concept Involving Noone” and looked up to fully focus on the ice that was maybe thousands of years old. The glacier was magnificent. You do not see glaciers in Louisiana, so they were the objects of significant admiration. This glacier was calving. That means that parts were breaking off and floating into Glacier Bay. A calving glacier will garner attention. It is a loud sound. It sounds like thunder when it breaks and landing on a rock sounds like a crash. The sound then echoed on the near by mountains. Wow. Perhaps the sound was so loud because other sounds were absent. The ship was slowly floating in front of the glacier. The people standing on the decks and on their balconies were watching. They were peering through binoculars and cameras. They were not making a sound. I have never heard silence on a cruise ship before. There was no laughing, carrying on or loud conversations. There was silence. It was a holy silence. We need to be awed. We God to “blow us away” with the beauty, majesty and power of His creation. We need the silence that was the only vehicle to offer praise to God in that moment. The silence was shouting praises to God. Has that ever happened to you?